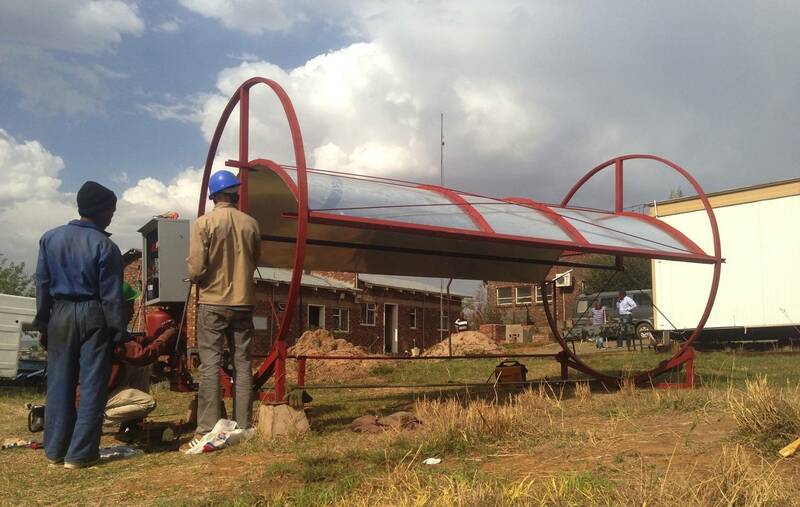 National University of Lesotho – In 2012, partners within the Physics Department at the National University of Lesotho requested construction of a small educational system for use in their undergraduate and masters level courses. This single-trough solar system functions as a miniature version of our other pilot systems, enabling students to witness (and measure!) first hand the harvesting of solar energy. The trough tracks the sun, heating up a fluid circulating through the central absorber pipe; students can measure the temperature of the fluid, change the flow rate, monitor tracking angle and solar position, and finally combine all of these data to calculate efficiency and total power flux from the sun. This system was funded by a UNDP GEF-SGP grant in partnership with ATS and NUL, and it will start to be used in NUL courses in early 2015.